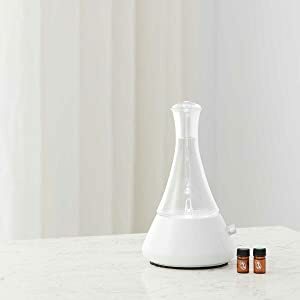 When you are looking to buy an essential oil diffuser that uses no water, no heat, and does not have plastic parts, you will want to consider the nebulizer diffuser. It uses 100% pure essential oils without water poured directly into its reservoir. It emits a pure mist of the oil fragrance that is the highly concentrated essence of the plants. Diffusers give you health and therapeutic benefits for your well-being and can help ease discomfort from colds, sinusitis, flu, stress, anxiety, and improve your mood. When you are stressed or have feelings of anxiety, the best essential oils will rescue you. 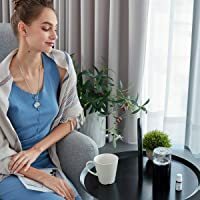 In summary, nebulizer diffusers are the best choice in diffusers because they indeed emit quickly pure essential oil fragrance providing aromatherapy for your body, mind, and spirit. Tell you how to use the nebulizer diffuser for the settings, timers, and other nifty characteristics. Once you read the information and facts given, see the pictures and graphics, and watch the videos, you will have a better understanding for how nebulizer diffusers function. This will support you where you save your time while I did the research for you showing you where you can save lots of money on specific diffusers. A timer—is needed to set intermittently to run 1-, 2-, and 4-hours. It will run for 2-minutes on and 1-minute off or operate continuously until it runs out of essential oil. When it does run low on essential oil, it will shut off automatically for safety. Should your diffuser not have a timer, purchase a digital timer that you can program for how long you want it to run. Adjustable mist—is for the amount of mist you want diffused into the air. The ideal nebulizer diffuser should have a button to control the mist from low to high and even with a medium setting. Noise level—is very quiet for nebulizers. You might hear some air or pump noise from the process within the internal workings. These do not produce more noise than an ultrasonic diffuser and I know because I own both types. The noise is around 50 dB. LED lights—are standard on almost all of the nebulizer diffusers. They can have only 1 color light or many cascading through about 7 colors or 1 color only. The lights can run continuously or be turned off. Room area coverage—is usually between 400- up to 1000-square feet depending on the unit you choose. Cordless, rechargeable, and electric—diffusers are always lightweight to take with you anywhere when traveling or to the office. Some are made with lithium-ion batteries that are rechargeable and/or with a cord to plug into a receptacle. They can be used in vehicles. There are many options available, so choose what serves your budget and needs. Warranties/guarantees—are standard with most diffuser manufacturers for 1-year with a 30-day guarantee if you are dissatisfied or the diffuser is defective. The power-house nebulizers are stylistic, beautiful, and small. Have one in your professional office, hotel lobby, Yoga and Pilates studio, massage and physical therapist quarters, and in all rooms of your home. Your visitors and clients will love the fragrance. The Utama Spice business is a 100% natural skin care company based in Ubud, Bali. 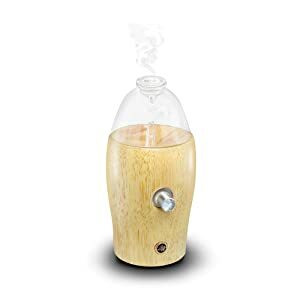 Using this new diffuser shown on Amazon.com®, number ASIN B079G5NHCY, you will be heavenly delighted with its adorable shape and misting capabilities. It is a luxury unit that’s whisper-quiet to use for your aromatherapy at home or have around with clients at your business. Sit it on your work desk, bedroom night stand, or anywhere you want the sumptuous aroma. Use it at the beach or park as well. It uses very little energy and you can run it up to 120-minutes from fine to heavy mist and it turns off automatically when the oil is low or gone. Use it on for 2-minutes and off for 1-minute for an intermittent cycle of 2-hours saving oil as well. Enjoy the one-color white long-life LED light for setting the mood with its soft glow. At the 2-hour cycle, it automatically shuts down, but the LED light will stay on. The LED light cannot be turned off and does not change to more colors. The base is gorgeous made of authentic wood, and the top is hand-blown lead-free Pyrex® glass. There is no plastic in this diffuser. It uses 100% pure essential oils and no water. Oils are not included but you will receive a free bottle of 100% pure essential oil when you register your diffuser. The tubing is not plastic and is made of precision-crafted glass micro-tubes. 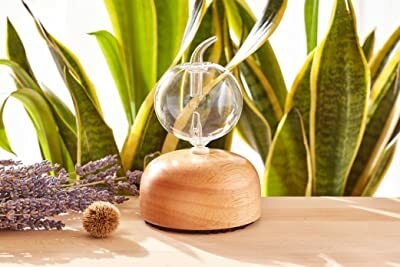 The essential oils make contact only with the glass and the air meaning there is nothing to react with or contaminate the oils ensuring the greatest therapeutic benefit, and a concentrated fragrance. Never add water to the essential oil! This nebulizer diffuser will cover 400-square feet of space and uses no heat. It does not off-gas and has no VOCs (Volatile Organic Compounds). Thicker viscous essential oils are not advisable to use and never put carrier oils into this or any diffuser! Clean the unit frequently with isopropyl alcohol for the best performance that is quick and easy to do. The dimensions are 12-inches tall x 8-inches diameter and it weighs 1.76-pounds. Add a USB battery pack and plug it into your USB port such as your laptop, car, or power supply using this type port. With its A/C adapter, you can plug it into a 110/120/240-Volt outlet. It is 0.5 mA input power with an output power of 50/60 Hz at 500 mA. The cord is 55-inches long. 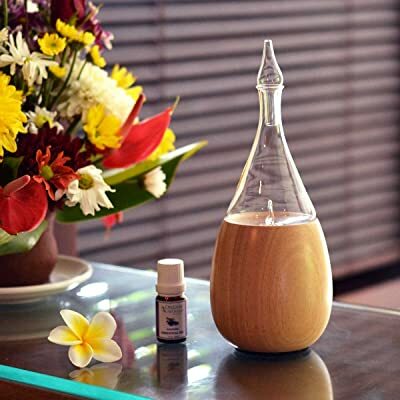 Utama Spice also sells 100% pure essential oils, yet any brand can be used in this diffuser. Gift-wrapping is available for someone you love and this would be nice in a dorm room at college. You will receive a User’s Manual and a 1-year Warranty. Your satisfaction is guaranteed so if you have a problem contact Utama Spice through Amazon within 30-days. It is made in Taiwan. Utama Spice Nebulizing Diffuser – Unboxing, Introduction, How to Use demo video. 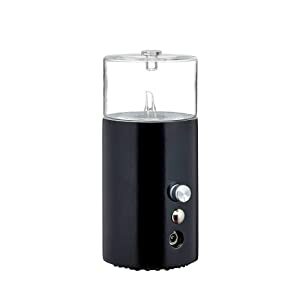 Utama Spice Danau Satu Nebulizing Diffuser Introduction and Features video. 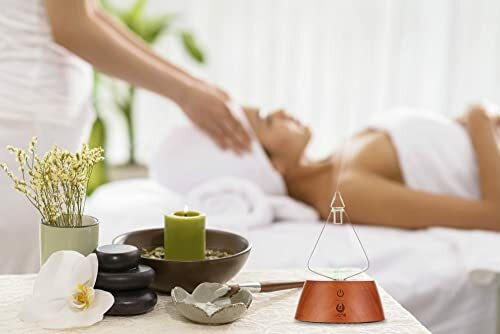 The Organic® Aromas Redolence diffuser with the black base is the one to buy for home, office, spa use and more places. Nebulizers do not use water and only pure essential oils. The ASIN B07J2ND12V with more product information is shown on Amazon.com®. The Redolence functions as do all other Organic® Aromas line of nebulizing diffusers. The pump inside is quiet and powerful, and it can run for 2-hours having a touch light switch. As a professional aromatherapist, this new diffuser will be loved with the fragrance it mists into the air for your clients. The cylinder shape is refined, simple, and elegant made of polished 100% natural, whole plantation hardwood and paired with elegant hand-blown cylindrical Pyrex® glass. Have it your way in faux light or dark wood grain to harmonize with your décor. With a non-slip bottom it will stay where you put it would slipping off. Being the first of its kind, the hand-blown glass reservoir on top is gorgeous to look at and functions will misting. The unit is refined and will be stunning in any office, place of business, or rooms in your home. Think outside the box and have a fashionable statement sitting on your table or mantle. It is a fantastic way to enjoy your 100% pure essential oils to enjoy. With its low energy use, it will cycle 2-minutes on and 1-minute off, shutting off after 2-hours, or when out of oil. It should cover an 800-square foot area with the finest fragrance. The long-life LED light is white and you can switch it on or switch if off if you don’t want to see the light. The dimensions are 6-inches tall x 3-inches wide. It plugs into a 110/120-Volt or 220/240-Volt receptacle. If your car has a 110-Volt socket, this diffuser will work. If you want a wireless diffuser for your car, this Aroma® Organics wireless rechargeable nebulizing diffuser is the one to get on Amazon. It comes equipped with a lithium-ion battery and a USB cable, see picture at left. Gift-wrapping is available for your diffuser loving family and friends and those who have not owned one before. You will receive a User’s Manual. The diffuser can be returned within 30-days if it’s defective and the customer service folks are excellent. It is made in China. Redolence nebulizer diffuser usage, care and cleaning video. 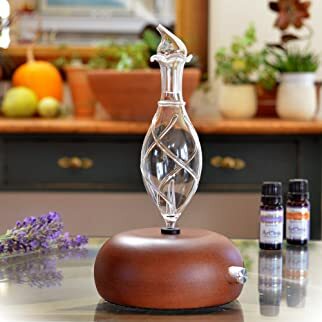 The Organic Aromas® new Opulence diffuser, ASIN B077S2NC29 on Amazon.com® is indeed a beautiful gracious element for adding to your home or office. The base is 100% white glazed ceramic and not the typical plastic. The top part is handblown glass made by excellent artisans. Nebulizers use no water so that you have the intense fragrance of your favorite essential oils (not included). Mold and mildew will not grow with no water and the entire unit is non-toxic for kids. Scent you home, office space, professional offices, hotel lobbies, massage and physical therapy studios with a gorgeous look and aromatherapy for everyone. Notice the buttons for a quick start with the easy touch white LED light switch for turning the light on and off. It lights up the glass tubes and is beautiful to look at. It will run intermittently 2-minutes on and 1-minute off to save your precious oils. 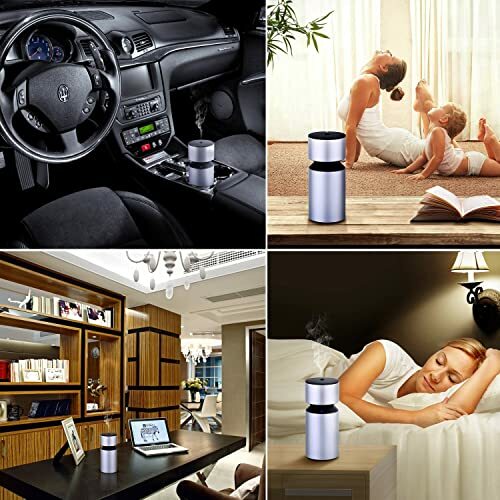 The diffuser will shut off automatically after running for 2-hours. Neither ultrasonic nor nebulizer diffusers use heat! Without heat the sustainability of the oils are preserved for a heady aroma having only a trace of sound from the fan. Use essential oils for dry skin, stuffy nose colds, dried mucous membranes, and a host of other ailments you might have. It’s best not to use thick oils that can clog the tubes. Never put carrier oils into a diffuser; they are to blend with essential oils for a massage. You can use citrus oils without a problem. The dimensions are 9-inches tall x 5.6-inches diameter and cover 800-square feet of space weighing about 1-pound. Plug the UL® listed cord into a 110/120-Volt, 50/60 Hz USA or Canada outlet. Gift-wrapping is available from Amazon if you want to surprise a loved one or friend with a fantastic diffuser. You will receive a User’s Manual and a 1-year free parts and service Warranty. If you encounter any problems with the Opulence diffuser, Organic Aromas® will fix the problem by contacting them directly on Amazon. You will be unable to return the diffuser after 30-days from your purchase date. It is made in China. 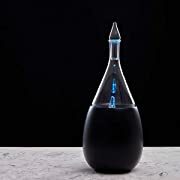 The ArOmis is a professional-grade aromatherapy nebulizer diffuser putting out a cold vapor from a glass diffuser unit. Nebulizers do not use water in a water tank. The versatile unit emits a cool mist using no heat because there is no water to heat. Therefore, the 100% pure essential oils (not included) do not disperse as quickly so that you will feel the oil’s effects for a longer time. The glass is hand blown and the base is from nature’s Beechwood tree. The unit comes in 12 lovely colors in different shapes, styles, and wood base configurations. No plastics are used in this unit. The oils will last until they are used up. You can tell by the aroma diminishing for the time to add more oils. This is not a humidifier or air purifier because it uses to water. The diffuser covers up to 900-square feet. It will automatically shut off after 60-minutes. You do not need to turn it off manually unless you want to. The diffuser allows you to set it to run 1-, 4-, 8-, and 12-hours of 10-minutes on and 10-minutes off so that you can forget about it. The unit conveniently runs continually for 12-hours with an automatic auto halt feature. Be sure to tell the vendor your preferred method when you order the ArOmis. The Orbis Nox Merus and all ArOmis diffusers are a benefit for a sick child. It is great for removing offensive odors. Use in your home living room, bedroom, at your health spa, the office, or anywhere you want the therapeutic benefits and wonderful fragrance of essential oils. Rejuvenate your mind and body using this beautiful glass diffuser. The pump is Bisphenol A (BPA)-free meaning there are no toxins. The pump is used to supply the air pressure needed from one of its tubes to disperse the oils into your environment. Clean with rubbing alcohol, rinse, and dry. Plug the UL listed power cord into a USA 110/120-Volt outlet and 220/240-Volts in Europe and countries outside of the USA. Let Amazon know which voltage you want. The dimensions are 11-inches tall x 7-inches wide at the base and it weighs about 1 pound. The base of the unit is covered so that the unit will not slide or slip off furniture. Gift-wrapping is available for a loved one or friend. You will receive the Merus glass bottle, the Orbis Nox wood base, an A/C adapter, a User’s Manual, and a Lifetime Warranty. Only ArOmis provides replacement parts for their diffusers past the 1-year Warranty. 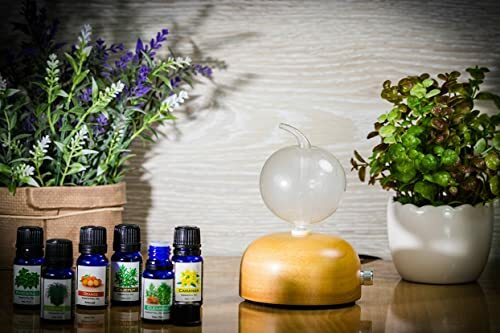 The Organic Aromas® Raindrop 2.0 best nebulizer essential oil diffuser is new for 2017 by popular demand from loyal customers. The Item model number Raindrop is shown on Amazon.com® at an affordable price for its beauty and all it does. It uses a touch sensor light switch for turning the LED Lights on and off with the touch of your finger. The gorgeous diffuser shaped like a raindrop made of lead-free Pyrex® clear hand-blown glass comes in a light plantation wood or black wood base to harmonize with your décor at home, the office, a spa, or massage or physical therapy studio. It is quiet and uses no heat with a control feature for how strong you want the mist to disperse using the volume switch. No water is used in this nebulizer; only 100% pure essential oils. The Raindrop shuts off after 120-minutes automatically. You can set it to cycle 2-minutes on and 1-minute off to conserve oil. It will cover 800+ square-feet. Just take off the top and put your oil into the fill line. No plastics are used in the manufacturing of this diffuser with its candle wick looking top end. The stem insert is a rubber stopper for holding the glass securely to the wood base. Enjoy your favorite essential oils (not included) anywhere for a charming look with fragrance, therapeutic, and holistic benefits. Many people today are using essential oils to sharpen their focus feeling more centered. The LED light rotates and is dim and soothing to watch with its calming and deodorizing abilities. Put 5 mL (100 drops) of essential oil into the unit and the fragrance is delivered at once. It will hold 25 mL (0.86 ounces) of oil. With the chrome knob, you can adjust the mist to be a high or low volume as you like it best. Do not add water! Do not use carrier oils—those are for body massages only! The nebulizer works by use of an atomizer to create a soft mist of essential oils into the air. The thicker the oils the more often you will need to clean the diffuser and that is easy following the manufacturer’s instructions. You can easily clean the glass micro-tubes with 95% rubbing alcohol by cleaning with cotton swabs. Use the alcohol on the glass reservoir as well. Do not get alcohol on the wood base. Swish the alcohol around for about 5 minutes letting the unit run. Running the unit will remove any blockages. You can also put the glass in a bowl of hot water and soak for 20 minutes. The unit does not have a timer, but you can buy one to control the time you want at any hardware store or on Amazon. The dimensions are 10-inches high and about 6-inches wide at the base. Plug the 6-foot UL® listed cord into a 110/120-Volt, 50/60 Hz, alternating current (AC) adapter for USA, Canada, and Mexico outlets. The power is 2.3-Watts. Outside the USA, Canada, or Mexico you will need to buy a 220/240-Volt adapter to put into your receptacle. The unit does not use batteries. Gift-wrapping is available for your loved ones, friends, and a special occasion. You will receive the diffuser, adapters, and User’s Manual. Organic Aromas® backs its Nebulizing Diffusers™ with a 1-year free Warranty on parts and labor. It is made in Taipei, Taiwan. The Pilgrim. Collection Sofia nebulizer diffuser has no water reservoir and uses no water for diffusing pure 100% essential oils (not included). The Italian design from Milan, Italy is simple, elegant, and lovely to look at. The Item model number Sofia is on Amazon.com® for you to check further. The best nebulizer essential oil diffuser has rubberized feet to stay where you put it. Fill the larger sized glass reservoir to the top or anywhere you want it for your session. The Sofia will use thick oils like eucalyptus and blends. You will enjoy the full aroma of the essential oils since there is no water used to thin it down. The cool-mist diffuser is BPA (bisphenol A)-free, so not to be worried about toxins for you or your children. It has only 1 LED light. The long-life LED light is one color of light yellow; it can run steady or fade bright to dim and can be turned off. There are no other colors to keep it soft. The best essential oils will give health and wellness for your children and you when placed into this diffuser. The aroma is wonderful for quiet time meditation, when reading a book, watching a movie, getting the kids to sleep, or when going to sleep. You will receive an extra glass insert with your diffuser if you should break one. The handmade ceramic white top goes over the glass piece and be sure it fits through the hole of the white top to not break the glass and have a mist come through that hole. The top fits into a rubber grommet on the base to fit snuggly in place for safety. To put it together, the point on the top piece goes into the oak base first with the smaller piece on top of that. The instruction book shows it put together, but not that the pointed part goes head first into the base. This is the reservoir that holds the essential oil. The smaller glass piece sits on top of the big one, pointed side up. Plug the cord into the base behind the front button first. It is easy to do that first rather than putting into the wall outlet first. It will cover about 215 to 270 square-feet of space with 15-drops of oil that should last several days on the low setting. It makes a fan noise at high. Two hours is the running time for the Sofia set at 2 minutes on and 2 minutes off. When you push the large aluminum bottom button in, it will start running. To make the mist higher, you will turn the button knob to the right, clockwise, and to lower the mist level, you will turn the button to the left, counterclockwise. The unit will shut off automatically after 2 hours and is very quiet. The dimensions are 6.3-inches tall x 12.5-inches around and weigh about 1.3 pounds. Plug the UL® listed 72-inch (6-foot) cord into a USA 110/120-Volt, 50/60 Hz, at 0.5-Amp outlet. The adapter is for USA, Canada, and Mexico outlets. In other countries, you will need to buy a 220/240-Volt adapter to insert into your receptacle. The unit does not use batteries. This cord is longer than most diffuser cords for more flexibility. The output power is 15-Volt or 500 mA at 7.5-Watts. The cord is ETL listed for your safety and never have the plug or cord in or near water. It will cause your circuit breaker to trip and could cause an electrical shock. Gift-wrapping is available for you and your loved ones. 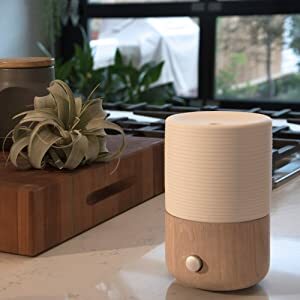 The diffuser comes with a User’s Manual with detailed instructions and a 1-year Warranty and 30-day money back guarantee with five-star customer service. The Sofia is made in China. 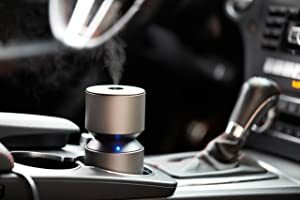 This Organic Aromas® Mobile-mini is the best essential oil diffuser for cars and uses no water—just your 100% pure essential oils (not included). Mobile means movable, portable, and transportable, so pick it up, fill it with essential oil, and plug into the USB port in your vehicle. Older vehicles use the cigarette lighter port. It is not ‘wireless’; it uses a 5-Volt USB cord to plug into a port and will run on its batteries alone; however, it is more efficient if left plugged in. Plugging the USB cable into an outlet will recharge the batteries taking about 5.5-hours to do so. It will run from 16- to 20-hours on a charge. You can also plug it into your computer or laptop port or an adapter. The ASIN B076YVDSBL on Amazon.com® is a trustworthy diffuser that is lovely to see emitting the mist from the top center fitting your cup holder. 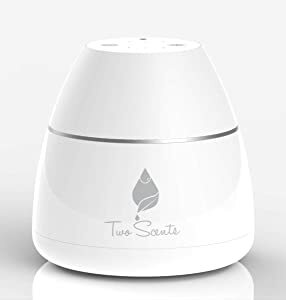 You will love having this battery operated essential oil diffuser with its 2 lithium batteries included that are rechargeable keeping your unit running continuously. The outside body is made of anodized aluminum with a soft matt finish. The reservoir holding the oil is handblown glass. No plastics are used in this diffuser. Without heat the sustainability of the oils are preserved for a heady aroma having only a hint of sound from the fan. Put it in your vehicle’s cup holder and take it inside with you to your office or massage studio. The aroma is pure using no water to weaken the intensity of the 100% pure essential oils. 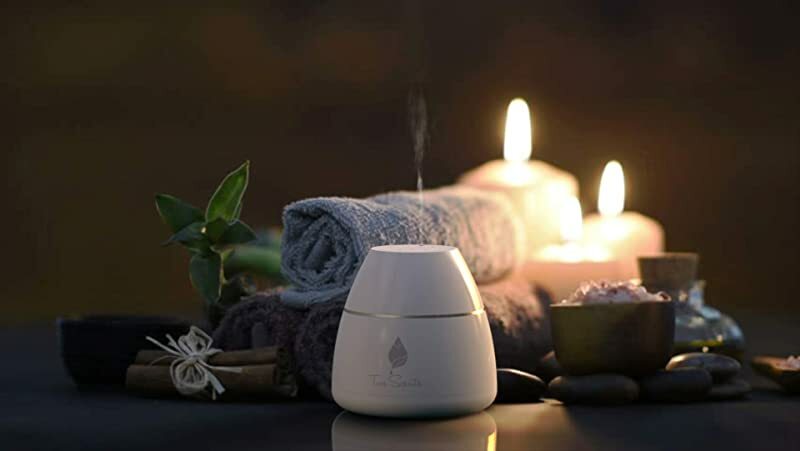 This lovely small diffuser is a power emitter of fragrance in your Yoga or Pilates studio, in hotel and bank lobbies, and anywhere you want breathtaking aroma all day. It will run intermittently 2-minutes on and 1-minute off to save your precious oils. The diffuser will shut off automatically after running for 2-hours. The dimensions are 6.29-inches tall x 2.67-inches diameter and weigh about 1-pound. It will cover about 600-square feet of space. Gift-wrapping is available from Amazon if you want to surprise a loved one or friend with a fantastic diffuser. You will receive a User’s Manual and a 1-year free parts and service Warranty. If you encounter any problems with this Mobile-mini diffuser, Organic Aromas® will fix the problem by contacting them directly on Amazon. You will be unable to return the diffuser after 30-days from your purchase date. It is made in China. The Two Scents brand nebulizer is wireless, can be used with a wire, the wire is needed for charging, and goes with you in the car! The ASIN B071HR46ZJ is available on Amazon.com® . Use at home, work, spas, Yoga or massage studios, a physical therapy room, and when traveling in your car SUV, or other vehicles. It uses no water and the mist is cool without heat. The essential oil bottle is attached securely to the diffuser. Simply fill it with your essential oils (not included). You will have no drops to count and no mess. The unit is lovely to look at, is small, and goes will with your décor with its light color, unpretentious logo, and silver band around the middle. There are 3 intermittent aroma intensity modes of 30-, 60-, 90-on and 120-minutes then off. The timer can be set for 1-, 2-, and 4-hours or continuous for about 50-hours of great fragrance. Fill 1 of the 2 amber glass bottles you get with the diffuser with the number of drops you want. I fill it to the neck to run all day. You can use blends, but not carrier oils that are used for massages only. If you don’t want the lingering smell to be around with a different fragrance, wash the bottle in hot soapy water and rinse. The unit shuts off when the oil is gone. Only use pure 100% essential oils in the bottle attached. Do not use carrier oils, vegetable oils, coconut oils, carrier oils, and other very thick oils. It is best not to use exceptionally thick essential oils because those are mainly resins. If you do, you can clog the nebulizer. If you clog it, clean it at once with a little rubbing alcohol letting it run 30-minutes, rinse, dry and let air dry. The diffuser uses a 1200 mA per hour rechargeable lithium ion battery. It will run 70-hours before needing a charge. At a full charge, the unit will run for 20- to 70-hours and this depends on your intensity settings. The lower the mist, the longer the essential oils last. The diffuser will cover 650 square feet. It will arrive with a USB A/C adapter to plug into 110/120-Volts, 50/60 Hz if you want to save the battery. Outside the USA, Canada, or Mexico you will need to buy a 220/240-Volt adapter to insert into your receptacle. I keep my plugged into the outlet all day to always have the battery charged when putting it into my car. Surprisingly, it is very quiet when running. Most nebulizers and other diffusers have LED lights. This unit does not have it but does have a small dim LED indicator for the functions in yellow. It is soothing to look at and can be seen in a dark room. The light on top blinks red when it needs to be recharged. The diffuser is 3.5-inches tall x 3.5-inches wide and weighs a small 7-ounces. Gift-wrapping is available for family and friends. You will receive in the box the waterless diffuser, the USB cord, A/C adapter cord, 2 reusable 10 mL (0.34 ounce) amber glass bottles, User’s Manual, free eBook sent to your email, and a 6-month Manufacturer’s Warranty with free returns or exchanges within 30-days of purchase. The diffuser is made in China. 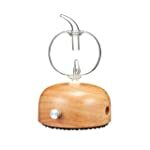 The Trillia BEEVEY handmade wooden diffuser is a new product for the company, item model number BEEVEY-SEW, on Amazon.com®. It is a dreamy looking diffuser made of genuine hard wood for weight, stability, and beauty. The wood is hand cut for its striking design, sanded smoothly, and coated with a safe natural finish. It will fit any décor and look stunning, but I would not say it’s a “beautiful and elegant art collection” as stated on Amazon.com®. A nebulizer unit does not use water; only 100% pure essential oils (not included) and the fragrance is more intense than the ultrasonic diffusers that use water. The top glass portion is made of heavy heat-resistant borosilicate glass. Borosilicate glass is made with silica, a mineral from the Earth, and boron trioxide as the main glass forming components. These withstand heat expansion whereas normal glass does not. You will probably know the trade name, Pyrex™ a Corning® trademarked product. This type of hand-blown glass used in this diffuser will keep you safe from breakage when using, unless you drop it. Place it in your home, office, massage and physical therapy studios, professional offices such as doctor and chiropractor offices, and use it in your vehicle. The essential oils you choose will relieve aches, pain, muscle soreness, headaches, and ease dry skin and mucous membranes helping with cold and flu symptoms. It comes with a long-life LED night light that you can have on or turn off. The unit shuts down automatically when it’s low on essential oil. The power button on the front is covered with a 25-facet faux diamond and is lovely to look at. No other diffuser I own or have seen has this unique design item. The cord is hardwired into the unit and is not removable. Plug into any USB device, use the cord adapter to plug into a wall outlet, or use the car adapter to use your battery plugging into the port or cigarette lighter. Run it intermittently or use the timer for its 4 different speed modes. The curved shape diffuser measures 6.6-inches tall x 3.2-inches across the base. Plug the 4-foot UL® listed cord into a 110/120-Volt, 50/60 Hz outlet in the USA/Canada. It operates at 1-Amp. To clean the glass part, wash just like you wash dishes. To clean the entire unit, put clear distilled vinegar in the glass, turn on and run for about 20-minutes. Dump out the vinegar, fill with water and run 20-minutes longer and the residual oils will be gone. Gift-wrapping is available for friends and family. You will receive a User’s Manual and it is made in Taiwan. The Uone nebulizer diffuser, ASIN B06XKYNKRY on Amazon.com®, is a gorgeous unit so modern and so Zen. The base is made of wood, the top and oil holders inside are all made of hand-blown glass. It is truly a diffuser to behold! Nebulizers use no water just 100% pure essential oils (not included). Therefore, you get the full intense richness of the oils that are not diluted with water. The therapeutic benefits are more evident as well. Simply fill the attached glass oil holder with about 20 drops of your favorite oil almost to the top and turn it on. The diffuser is whisper-quiet to not disturb anyone sleeping, including babies. Enjoy an ambience and set the mood with the 7 different LED lights that cascade through all the colors or turn the lights off. It will not set to one favorite color on this model. It will cover a large space of 800-square feet and shut off automatically when the oil level is low after running about 2-hours. Set the timer to run intermittently at 2-minutes on and 1-minute off or continuously. 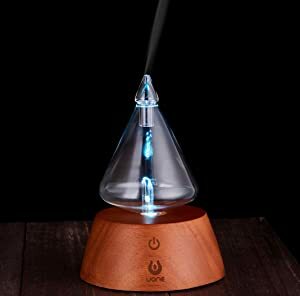 The Uone diffuser is so lovely that you can put it in your home, office, Yoga, and Pilates studio, massage, and physical therapy space, in hotel and bank lobbies, doctor, dentist, chiropractor’s and all professional offices. With its aroma wafting through your area, everyone will enjoy the fragrance. When you are fatigued at the end of the day, enjoy the oils while reading, watching a movie, or when meditating. Use the oils you love most when you have insomnia, use for your baby feeling ill, teenagers, and yourself during the day or night. I love using this on my nightstand in my bedroom for a good night’s sleep. No worries about safety because it shuts itself off. The diffuser is 4.92-inches tall x 5.08-inches wide x 8-74-inches long and weighs about 8-ounces. Plug the UL® listed 4.9-foot cord into a 110/120-Volt, 50/60 Hz outlet in the USA, Canada, and Mexico. Outside these countries, buy a 220/240-Volt adapter to run it. Gift-wrapping is offered for your family, loved ones, and friends for a special occasion or birthday. You will receive instructions and a 30-day refund if you are dissatisfied with a 2-year Warranty. The diffuser is made in China. Never put carrier oils into any diffuser! They serve no purpose and are too thick to ruin the unit. Carrier oils are added to essential oils when doing a body massage. Do not use vegetable oils, coconut oils, and other very thick oils. It is best not to use exceptionally thick essential oils because those are mainly resins. If you do, you can clog the nebulizer. Use only the amount of essential oils to the max line or enough for the amount of time you want the diffuser to operate. If you add too much essential oil at first, it might oxidize, become sticky to clog the tubes and spray nozzle. Don’t move the nebulizer when it’s running; turn off and unplug before your move it for safety. It’s best to clean your nebulizer at least once each week if you run it all day every day. Otherwise, if you use it occasionally, once a month should be fine. You can use dish detergent in warm water or alcohol. I hope this article has given you an insight into diffusers, specifically, nebulizer diffusers. Just remember, nebulizers use no water and only 100% pure essential oils, while ultrasonic diffusers use water with you adding drops of your favorite essentials oils to the top of the water. Read customer Reviews on Amazon and always look for a long Warranty time period with the ability to send the diffuser back if you don’t like it, it’s defective, or whatever. Enjoy the smell of the roses in your best nebulizer essential oil diffuser if you use rose essential oils that are quite expensive. Lavender smells good too and just be happy with the fragrance of your choice. Happy shopping! thanks so much for the information, and explaining all the differences. Thank you Brenda, I appreciate all the information and tips. I currently use ultrasonic diffusers in my home. I’m always concerned that with extended use there could be damage to the surrounding area, such as wood. Since the nebulizers mists pure oil, do you know if they will they cause damage to wood? Very good info I have been looking into nebulizer diffusers.